We recently took our annual trip to Polzin Farms in Cedarburg, WI for some good old-fashioned strawberry picking. We came home with 14 pounds of juicy, red deliciousness. So what does one do with 14 pounds of strawberries ? Get creative. I’m like the Forrest Gump of strawberries: strawberry rhubarb crisp, strawberry french toast, strawberry banana smoothies and my latest, grilled pound cake with balsamic strawberries. This is a fresh take on strawberry shortcake. I went all Sandra Lee and semi-homemade this one with store-bought pound cake. If you want to bake a fresh pound cake, I’m sure it would taste even better. This is a great dessert when entertaining. Just a quick toss on the grill and you are ready to go. Clean and oil grill. Pre-heat grill or grill pan to medium-high heat. In a small saucepan, heat strawberries, balsamic vinegar and sugar. Stir occasionally until warmed through. Keep warm until served. Brush pound cake with olive or coconut oil. Place on heated grill. Sear for about 1-2 minutes on each side, making sure it doesn’t burn. 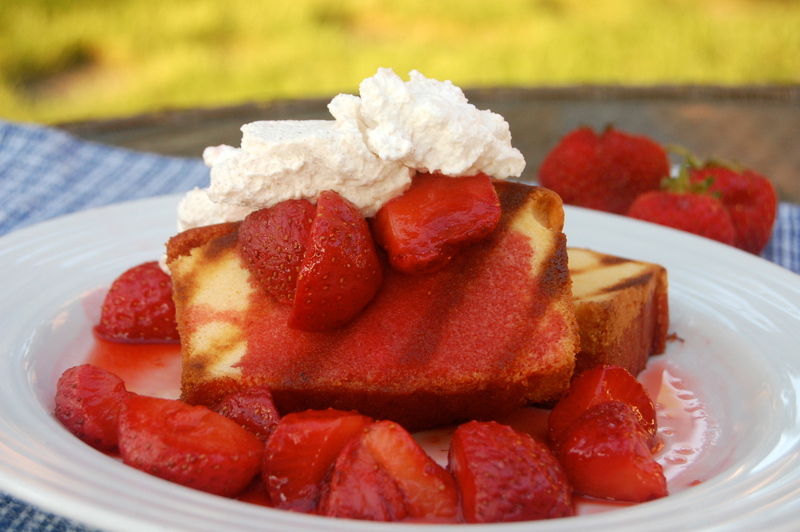 Place pound cake slice on plate, top with strawberries, strawberry sauce from the pan and whipped cream. 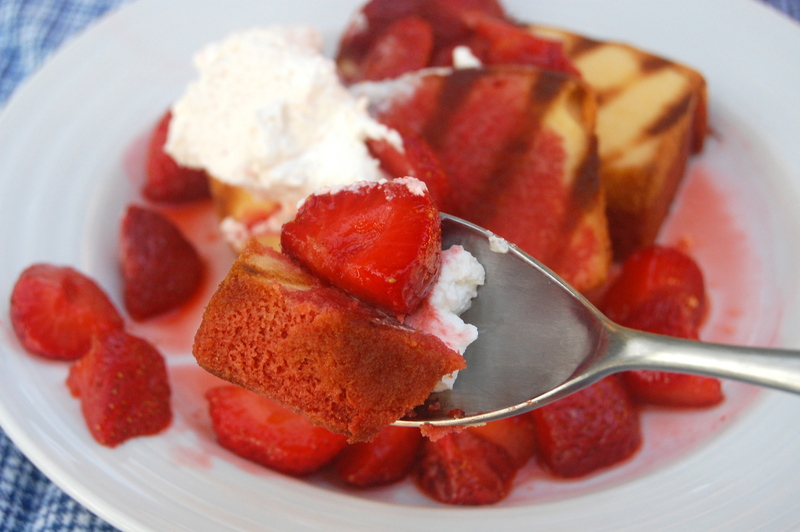 I love the idea of grilling pound cake. And strawberries and balsamic are such a fabulous combination – can’t wait to try this!